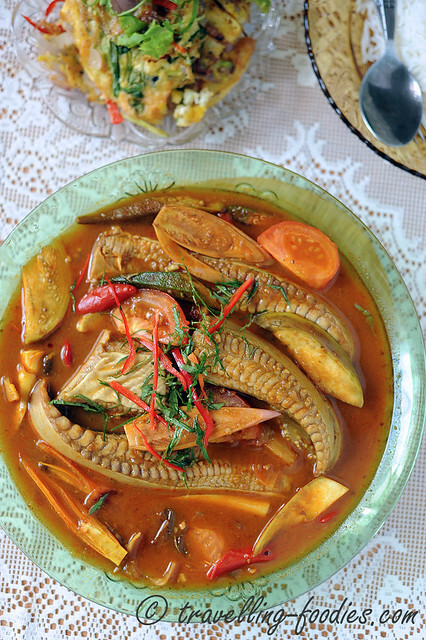 Ikan Pari Asam Pedas is a dish which we enjoy tremendously. So much so that I cook it more often that I do than Ikan Gerang Asam which we ought to be more familiar with. The two are essentially very similar with slight variations between them. 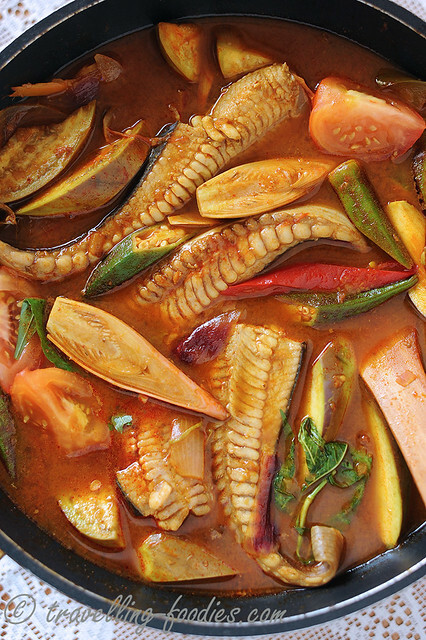 Firstly, the “kuah” (sauce) for Ikan Gerang Asam is more “pekat” (concentrated) due to the addition of buah keras which is not found typically in Ikan Asam Pedas. In fact, the Ikan Asam Pedas served at my favorite “makan melayu” stalls at Marine Parade and Katong are so watery it can literally be drunk as a soup! And trust me, I would more than be glad to do so because the versions they cook are sooooo sedaaaaap! Anyway, I’ve digressed. Apart from that, lemongrass is also absent in the rempah of Ikan Asam Pedas but added as smashed stems into the cooking of the kuah itself. 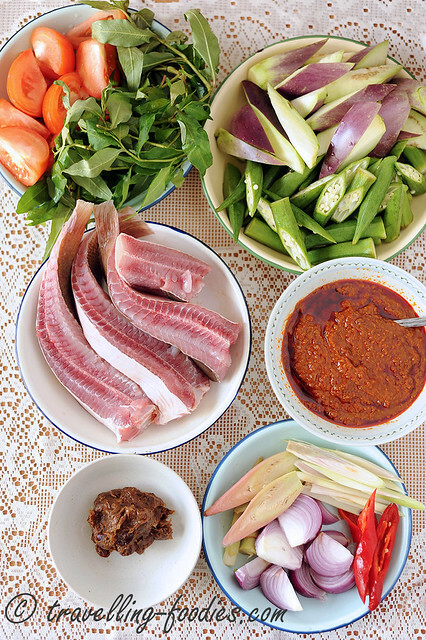 The most obvious difference however, between these two sour and spicy fish dishes is the incorporation of bunga kantan and daun kesum in the Malay version, but not found in the Peranakan counterpart. To me, there incorporation is what makes kueh asam pedas truly yummy which I can down generously over steamed rice and yes, you’d guessed it, drink the sauce on its own! The cooking process is very straightforward with the most tedious part being the preparation of the rempah. With that out of the way, the cooking part is a breeze, literally just minutes from the addition of the vegetables and then fish, to serving it on your dining table! The ingredients are pretty standard for Ikan Asaam Pedas but one very important thing is to ensure that the fish is very very fresh! 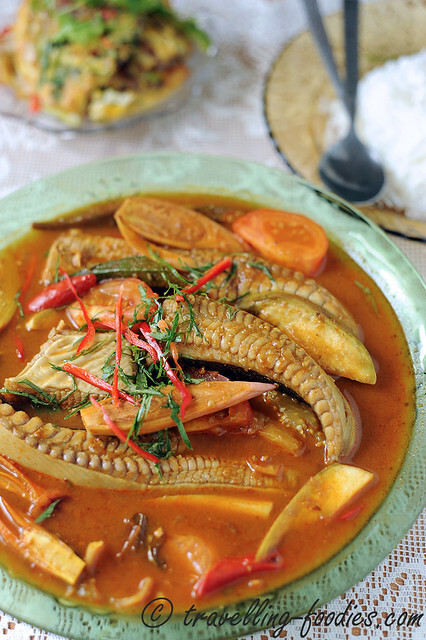 Do not cook this dish if the fish used is already past its prime to rebus in a kuah. Grilling with a generous application of sambal or even cooked in kuah lada may just be sufficient to mask any unpleasant odours from a fish which is lesser desirable for steaming or poaching, but not for this dish for the sweetness of fresh fish is one of the main highlights without which, it would most probably fail to take off and shine. Otherwise, the standard mixture of vegetables like brinjal, tomatoes and Okra, as well as some condiments which I’d added directly into the kuah, like coarsely chopped red onions and a few fresh red chilies. The rempah I’m using is a generic rempah which I’d prepared some months back, well frozen in individual portions in the fridge and virtually left forgotten, until yesterday that is, when the discovery of the fresh stingray invoked an almost distant memory of remnant portions of frozen rempah from the last batch made, from which this current portion is the last of it. Timely for more rempah making to come! I used a Thermomix as the one-step machine to prepare the rempah, from the grinding of ingredients to the “tumis”-ing. All done within 30 mins and save from all that splattering one would experience if the rempah was prepared the traditional way with batu lesong and kuali. The time saved allows me to “multi-task” with the preparation of the rest of the ingredients meanwhile. And that is precious time saved indeed as I had to finish the dish before the rains come, which is so ever frequent nowadays in the late afternoons. 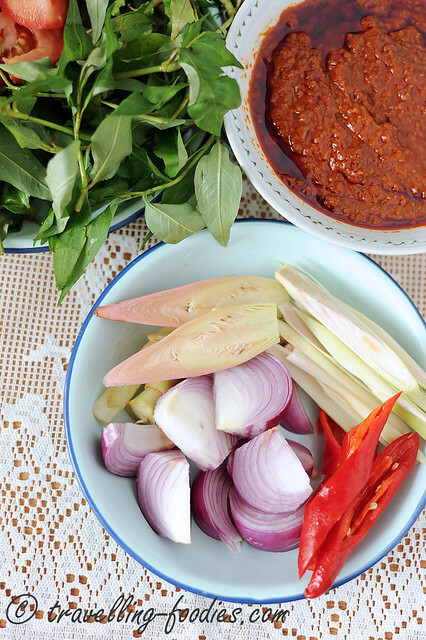 As mentioned earlier, the two important ingredients in the kuah ikan asam pedas lies strongly in the bunga kantan (torch flame ginger bud) and the daun kesum (vietnamese mint). 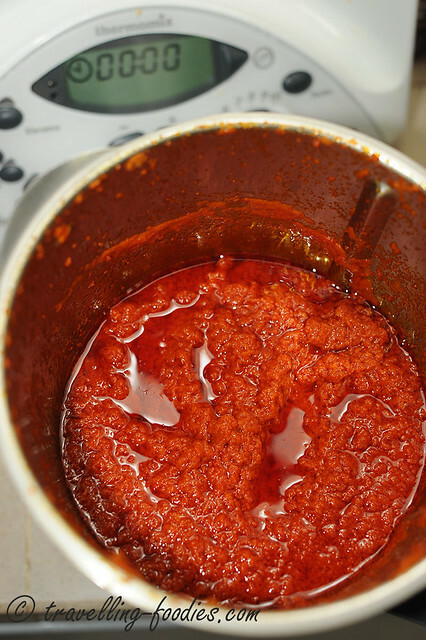 A little alteration really goes a long way, changing the taste of the sauce completely. 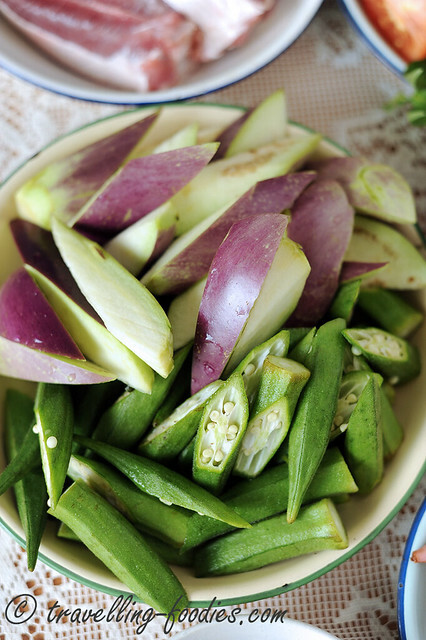 Standard concoction of vegetables include brinjal, okra and tomatoes. The shorter and stouter “egg plant” variety is used and not the long ones which tend to soften too quickly before then can be well seasoned by cooking in the sauce. Be sure to choose the softest and smallest okra aka lady’s fingers as they taste the best. Once the rempah is prepared, in my case, taken out of the freezer and thawed briefly, the process of cooking is very straightforward. Just make sure that the stingray is well-cooked but just cooked at the same time! 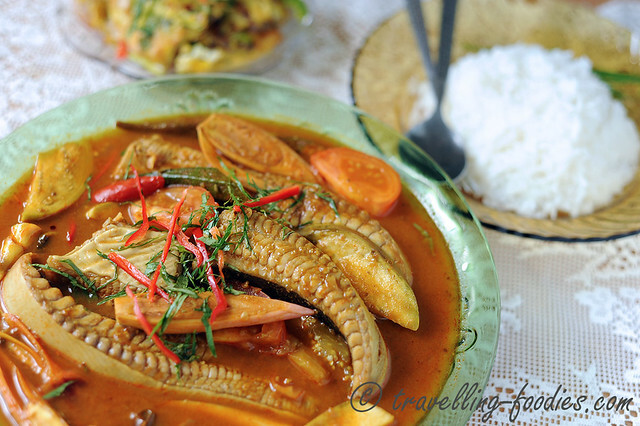 And while the ikan pari are “rebus-ing” in the cooking sauce, be sure to cook some steamed rice. You would most probably need a plate of it, to go with the fish and assorted vegetables, and some may even need two! This entry was posted on May 8, 2015 by Alan (travellingfoodies). It was filed under Food, Simple Eats and was tagged with asam pedas, ayer asam, Bendeh, bendi, brinjal, bunga kantan, cili, daon kesom, daun kesum, ikan pari asam pedas, ladies finger, lemongrass, okra, red chili, rempah, serai, seray, stingray, tamarind, terong, terung, tomato, torch ginger blossom, vietnamese mint. yeah you are absolutely right!!! i love asam pedas to the max as well! Such a shame, because while stingray can be substituted with other meaty fish varieties, I can’t think of something which can used to replace the torch ginger bud (bunga kantan), which lends such a unique aroma and flavour to the sauce.